1. National Psoriasis Foundation. What is psoriatic arthritis? June 2017. www.psoriasis.org/sites/default/files/psoriatic_arthritis_fact_sheet_1.pdf. Accessed January 23, 2018. 2. Mayo Clinic. Psoriatic arthritis. www.mayoclinic.org/diseases-conditions/pso­riatic-arthritis/symptoms-causes/syc-20354076. Accessed January 23, 2018. 3. National Psoriasis Foundation. About psoriatic arthritis. www.psoriasis.org/about-psoriatic-arthritis. Accessed January 24, 2018. 5. National Psoriasis Foundation. Moderate to severe psoriasis and psoriatic arthritis: biologic drugs. www.psoriasis.org/about-psoriasis/treatments/biologics. Accessed January 25, 2018. 6. Pfizer. Pfizer announces FDA approval of Xeljanz (tofacitinib) and Xeljanz XR for the treatment of active psoriatic arthritis. December 14, 2017. http://press.pfizer.com/press-release/pfizer-announces-fda-approval-xeljanz-tofacitinib-and-xeljanz-xr-treatment-active-psor. Accessed January 22, 2018. 7. Pfizer. Multimedia: U.S. Food and Drug Administration approves Pfizer’s Xeljanz (tofacitinib citrate) for adults with moderately to severely active rheumatoid arthritis (RA) who have had an inadequate response or intolerance to methotrexate. Press release. November 7, 2012. http://press.pfizer.com/press-release/multimedia-us-food-and-drug-administration-approves-pfizers-xeljanz-tofacitinib-citrat. Accessed January 24, 2018. 8. Pfizer. Pfizer announces FDA approval of Xeljanz XR (tofacitinib citrate) extended-release tablets, the first and only once-daily oral JAK inhibitor treatment for rheumatoid arthritis. February 24, 2016. www.pfizer.com/news/press-­release/press-release-detail/pfizer_announces_fda_approval_of_xeljanz_xr_tofacitinib_citrate_extended_release_tablets_the_first_and_only_once_daily_oral_jak_inhibitor_treatment_for_rheumatoid_arthritis. Accessed January 23, 2018. 9. Xeljanz/Xeljanz XR (tofacitinib) tablets/extended release tablets [prescribing information]. New York, NY: Pfizer; December 2017. 10. Mease P, Hall S, FitzGerald O, et al. 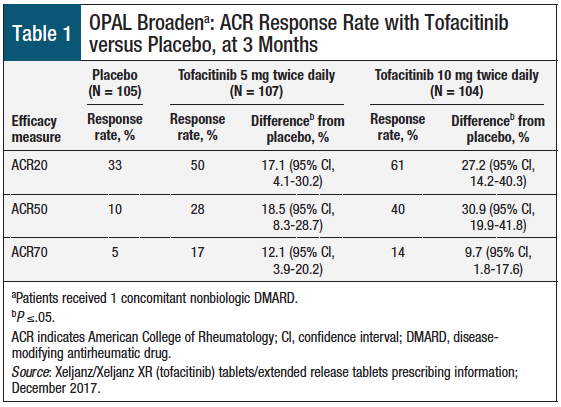 Tofacitinib or adalimumab versus placebo for psoriatic arthritis. N Engl J Med. 2017;377:1537-1550. 11. Gao W, McGarry T, Orr C, et al. Tofacitinib regulates synovial inflammation in psoriatic arthritis, inhibiting STAT activation and induction of negative feedback inhibitors. Ann Rheum Dis. 2016;75:311-315. 12. Gladman D, Rigby W, Azevedo VF, et al. 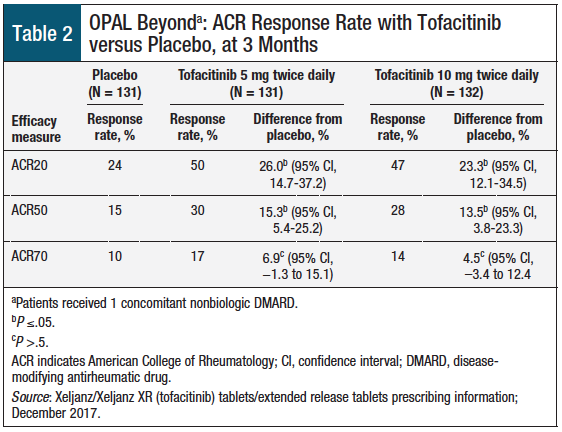 Tofacitinib for psoriatic arthritis in patients with an inadequate response to TNF inhibitors. N Engl J Med. 2017;377:1525-1536.